Review Summary: Claims of revolutionism aside, it is very nice to hear Justin Timberlake sing again. I want to point out the specific moment from The 20/20 Experience that made me realize the album’s merit. Toward the end of “Mirrors,” the song starts a lengthy wind-down process (a format that most of the album’s songs follow), and underneath his falsetto, Justin Timberlake repeats, “You are, you are, the love of my life,” ad infinitum. The line has a robotic cadence to it that is further accentuated by effects on the vocals, and I was actually surprised when I realized what he was saying. It didn’t feel right – those words put through those effects and sung in that way. But with only thirty seconds left in the song, most of the distortion disappears from Timberlake’s voice and he sings the line a little more tunefully. It’s subtle and brilliant. It’s human. Give Timbaland some credit here. Throughout the seventy-minute runtime of The 20/20 Experience, he continually rips away tablecloths like that, slightly skewing songs that might otherwise wear out their lengths. FutureSex/LoveSounds, while excellent, suffered because of its endless preludes and interludes, making songs feel unnecessarily cobbled together into differing sections. With this album, he is much more willing to let the songs speak for themselves, riding out their lengths and evolving fluidly. It’s a lot easier to accept an hour-long pop album when the songs are treated as naturally occurring entities instead of anomalies that need to be justified with parentheses and slashes in their titles. “Pusher Love Girl” is a picture-perfect opener, an eight-minute song that feels like four, bolstered by Timberlake’s oscillating vocals in the chorus and Timbaland’s stop-and-start instrumental production. The song, and the album as a whole, sounds as natural as if it was recorded with the live band Timberlake used during the FutureSex/LoveSounds tour. “That Girl” in particular is capable of transporting the listener to the back booth of a corner club in Memphis; basically, it is Elvis filtered through R&B, and I can’t help but think that The King would be singing a song a little bit like it if he was a young singer today. As good as those songs are, it’s the closer “Blue Ocean Floor” that should get the most attention, although it probably won’t because of its subdued nature. But it’s important to emphasize how unique the song is within the landscape of mainstream, smash-hit pop, a world that Timberlake has inhabited for his whole career. While songs like “Another Song (All Over Again)” and “Losing My Way” from FutureSex/LoveSounds were slower and more ostensibly “heartfelt” than the rest of that album, their plodding pace and the saccharine cliché of the lyrics didn’t really fit. And while “Blue Ocean Floor” doesn’t sound like anything else on The 20/20 Experience, it ends up being a perfect closer because it encapsulates what the album is all about. Timbaland works wonders with the music, highlighting empty spaces and filling them with reverberating blue noises, and Timberlake’s performance is soulful without losing heft. But again, with only two minutes left, the song shifts, the sand dropping away, only to come back fuller, those empty spaces filled with strings. The song is about love as sonar: listen as the beat searches and searches and finally finds what it was looking for. Not everything works, as much as I would love to say it does. “Strawberry Bubblegum” is the only song on the album that fails to justify its length. It’s a nice enough track, but it would have been better served without the lounge-ish outro, during which I can’t stop imaging Timberlake with Wayne Newton’s hair and a huge microphone. Jay-Z is the weak link in the otherwise great “Suit & Tie,” and given his position as the album’s one and only guest star, it’s hard to imagine why he was included at all. Timberlake is skilled enough to carry an ambitious album like this in his sleep, and a lame duck verse by Jay-Z only emphasizes that. 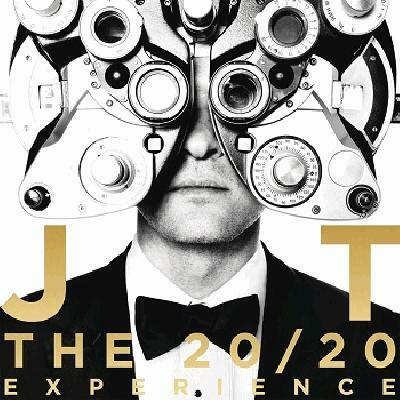 Furthermore, too often does The 20/20 Experience cover lyrical subjects that have been done countless times already (see: woman as drug, woman as extraterrestrial, woman as object of affection for man from lower social class). But the main job of pop music – and this is where it so often fails – is making the same old tropes sound fresh, and Timberlake/Timbaland certainly do that here. Katy Perry can sing about E.T. all she wants, but it’s basically impossible to imagine her singing “Spaceship Coupe” (as a side-note, consider how fluid and dynamic the guitar solo in that song sounds, then compare it to the processed, gimmicky saxophone in Perry’s “Last Friday Night.”). It is similarly difficult to picture any of the countless artists who have compared love to drugs pulling off “Pusher Love Girl” like Timberlake does, which is to say that he somehow makes it sound like he’s the first person to ever realize the metaphorical similarities between love and MDMA. Which brings me back to “Mirrors,” a song that is based around an idea that is kind of dumb (woman as mirror). But it ends up being one of the album’s best tracks precisely because all of the elements – Timbaland’s production and beat, Timberlake’s voice and delivery – come together in a way that makes it sound anything but dumb. They sell something that otherwise might be unsellable, and what’s more is that the listener doesn’t feel conned, or pressured into qualifying the song as a guilty pleasure. It is immaculately and exuberantly crafted, with a real respect for those who have come before; it is music as tribute, music as love. well from what i've heard so far at least. I can see this being early AOTY contender quite honestly. This is coming from someone that never planned on giving JT a chance, and someone that was highly skeptical going in. Word really want to check this out actually.